This trike is known, for some reason, as the “EZ-Tri Classic,” which is a mouthful. They used to call it the EZ-3, and we still do. It was even re-designed a few years ago, so it isn’t exactly “classic.” Putting that aside, let’s look at this spunky little dude. 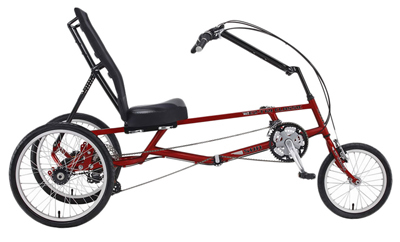 The steel frame EZ-3 is a great trike for running around town. It is easy to get on and off of it, it turns tight turns, it sits your eyes up high but keeps your center of mass comfortably low, and it is cargo-ready for your grocery runs. Unlike our other trikes, this is a “delta” style, with one wheel in front and two in back, while the more common”tadpole” style has two wheels in front. Which is better? That depends on what your are going to do with it, and it also depends on what you like the feel of. Some people really like having their handlebars in front of them, both for riding and for getting on and off. The ability to make direct comparisons between our trikes is the advantage to coming to a shop like ours where the range of choices is all in one room. All of its transmission and brake fittings are standard, so while the stock parts are nothing fancy, you can upgrade them as you feel necessary. 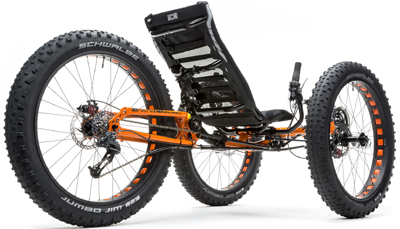 While the EZ-3 costs more than your typical “granny trike” it is significantly better. It is significantly safer, if granny wants that. It is way cheaper than fixing a broken hip, should granny take a turn the wrong way on her traditional upright “granny trike.” It offers a comfortably wide range of gears, much better braking, and a seat height that is neither too high nor too low. Pay more, get more. The EZ-Tri is the real value in casual tricycling. Even granny will think so. 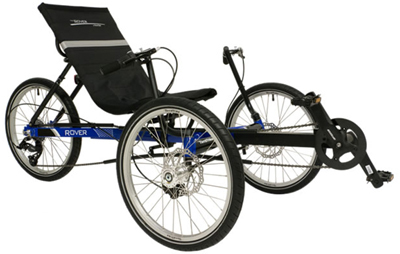 If riding a regular recumbent is easy and comfortable, then riding a recumbent trike is even better. 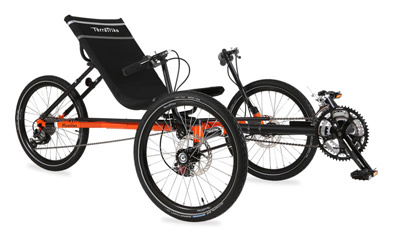 With the EZ-Tri Classic recumbent trike, the rider gets the comfort and mechanical pedaling advantage along with the stability and confidence a trike brings. “I had good control while riding down the street. After the third time up and down the street I thought: Yeah baby, this is wonderful and I’m hooked!” exclaimed an excerpt from Recumbent & Tandem Rider Magazine. 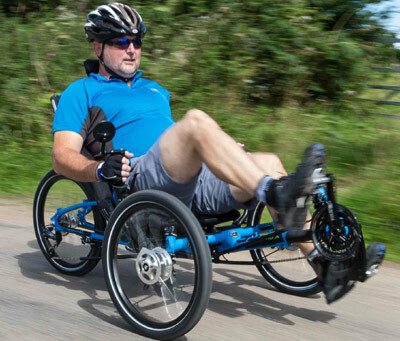 “All things considered, I do think the trike is a good value for anyone interested in riding for recreation, fitness, or commuting,” said BentRider magazine, a publication devoted to recumbent bicycles. 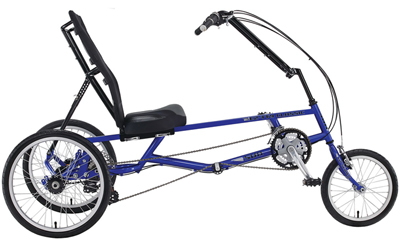 Try the EZ-Tri Classic for yourself and discover the wonderful world of recumbent trikes. Boring technical specs from Sun Seeker follow, along with our interesting comments. Despite its length, the EZ-Tri will turn crazy tight due to the delta design. This is a very maneuverable trike. While this nimbleness lends it to sidewalk use, be aware that the spread of the wheels is behind you, and you don’t want to drop one wheel off the curb. In case you need to knock down any walls in your house to get it inside. Quite narrow as trikes go. You can drive it through most doorways. Quite high. Delta trikes have a stability advantage in that the spread of the rear wheels is closer to your center of mass, but they will still tip, especially on a fast downhill. Heavy! But this is a high-sitting trike using low-cost high-tensile steel. Tadpole trikes weigh 30-45 pounds but sit lower. That is a pretty huge range of adjustment. We’ve sized them even smaller using custom handlebars and cranks. See our discussion of ex-seam length here. Sun’s seat is comparatively heavy but remarkably comfortable. Features an adjustable lumbar curve and two more bottle cage mounts. Cheap, but upgradeable if it starts to croak at you. This crank is riveted together, so if you change to a shorter crankset we’d need to sell you new rings, which makes that upgrade more expensive. “Winzip” sounds like something you’d use on your computer, but this is actually a pretty good economy brake. The two rear hubs roll on an axle. The drivetrain on a delta trike is more complicated, and often a bit noisy since the sealed bearings that the axle rolls on can shift under the weight of a heavier rider. We go to extra work to mitigate this. We even design a special tool to make the bearings seat better, but you’ll still get some creaking.